Catholic priest, Rev. Fr Philip Jamang, has described the rejection of Bishop Peter Okpalaeke by some members of Ahiara Diocese, Mbaise, in Imo, as a “disgrace” to the Catholic Church. 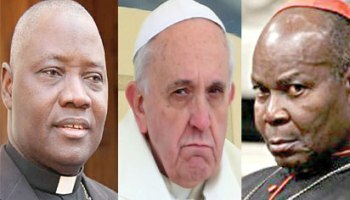 Jamang, Parish Priest of Church of Assumption, Chongo Pyel, Jos, told newsmen that it was particularly wrong for some priests to support those against a Bishop appointed by the Pope. Ahiara Catholic Diocese has remained without a Bishop, more than four years after the death of its pioneer Bishop, Rt. Rev. Victor Chikwe, after the rejection of Okpalaeke, who was appointed and consecrated in 2012.